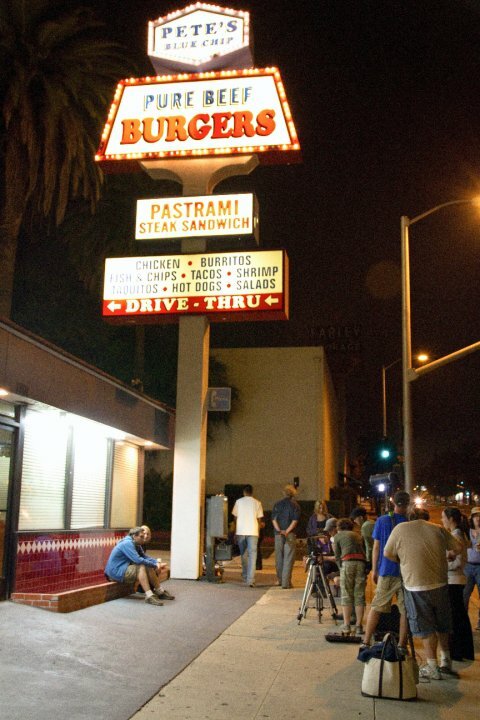 Our second last location was Pete’s Blue Chip on Colorado Blvd in Eagle Rock, CA. They were such awesome people and very cool to work with! It’s an Eagle Rock institution, having been around forever, and when you walk in, that been-here-forever nostalgia is thick in the air. We shot at the empty lot during the day on the Wednesday, and then the company moved to Pete’s for our evening meal (“lunch”) and another four to six hours of shooting. Pete’s knew we were coming and were very accommodating to allow each crew member to order separately and then have us pay all at once at the end. The food came out quickly and everyone chowed down! I had their famous breakfast burrito. It was super yummy! Then we set to work. We had three exterior night scenes to cover with three actors. And our actors were super patient. This was our only night shoot, and they knew it, so everyone was geared up to work hard and stay focused. I was feeling a little fatigued on this particular evening and was super grateful for my key peeps. I felt like a web of love was holding me upright and everyone was focused on telling the story as beautifully as possible. The people at Pete’s worked with our gaffer to make sure everything was lit right inside the restaurant after they closed and a key staff member stayed around until we were done so our people could use their bathrooms. So thank you to Pete’s Blue Chip for their generosity and great service. And thanks to my crew who wrapped me in love, patience and hard work on this particular night shoot. Hugs!